Keep your feet happy and healthy with many of our pedicure options. Similar to our Manicures, these services are designed to improve the condition of your feet by stimulating natural nail growth and massaging the surrounding area. Foot health is essential to overall well-being. 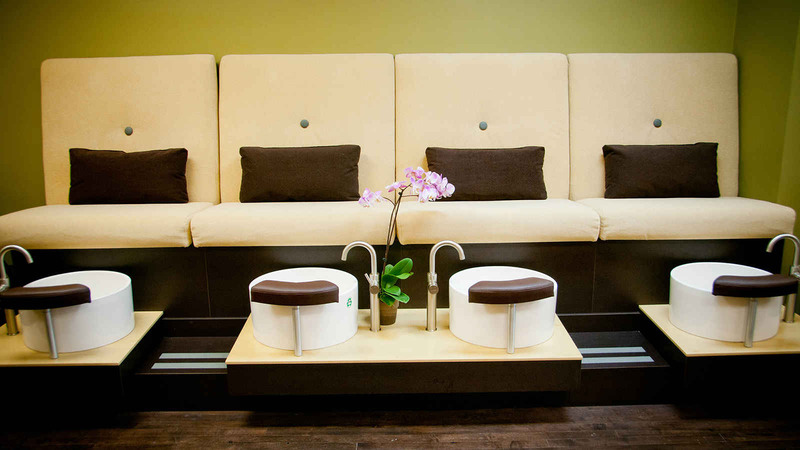 (All of our pedicure stations are constructed from nonporous sealed ceramic in order to prevent bacteria from forming, thus ensuring a consistently clean environment). Begin with a relaxing soak in our calming, jet-less pedicure vessel. Enjoy expert nail and cuticle care as we file and buff your heels into shape. Follow with an exfoliating sugar scrub and soothing foot/calf massage. Finish with your favorite polish. Luxuriate in an aromatic foot soak and enjoy a relaxing foot/leg massage. Follow with our Classic Pedicure. This custom blended pedicure will rejuvenate your lower limbs and your mind. Finish with your favorite polish. An ideal service for walkers and runners. This therapeutic pedicure alleviates heaviness and tension in your lower legs and feet. Peppermint oil revives aching muscles and soothes the skin. Reward your hard working feet; give them the treatment they deserve! Your feet have over 7200 nerve endings and 2000 sweat glands. The bottoms of the feet have the largest pores, making the foot bath an ideal detox option. Our custom foot bath – including magnesium, Epsom salt, sea kelp, and tea tree oil – draws toxins away from the body. Along with reflexology techniques (applying pressure in order to effect a positive change in the body), we improve the condition of your feet. Once soaking is finished, a natural sugar scrub is used to remove any toxins that may be clinging to the bottom of the feet and to remove dead skin cells. This treatment is a must try! Designed specifically for men. This custom treatment leaves feet looking incredibly groomed and refreshed. For the young ladies. Nail shaping, relaxing soak, foot and leg massage, and favorite polish.